Mozart’s first visit to Prague was in 1787 and he stayed for about a month, attending concerts, performing solo piano concerts and mostly enjoying the attention of the people. He returned to Prague several times after that and his presence is still felt in several parts of the city. We take a look at some of the buildings and statues and memorials that tell the story of Mozart in Prague. 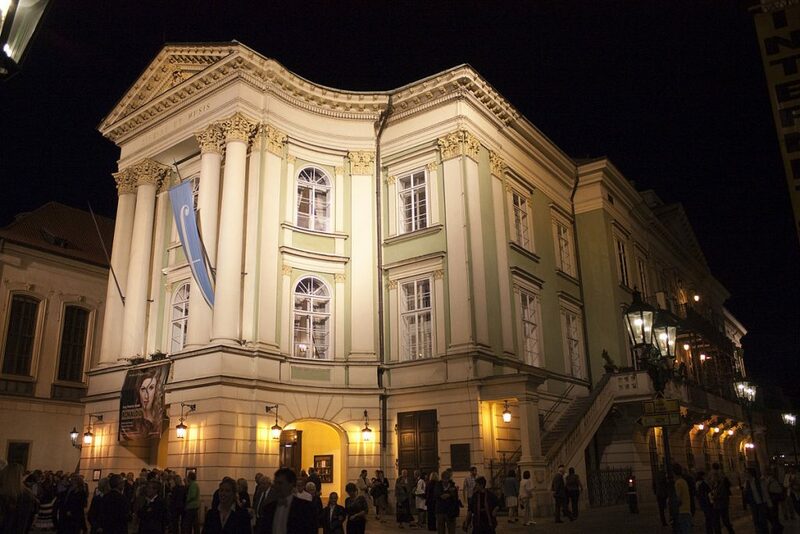 Mozart returned to Prague later in 1787 to oversee the premiere of one of his most famous operas, Don Giovanni. The event took place at the Estates Theater, which is still open today. The work was loved by both critics and the public. Some of Mozart’s operas had already been presented here. For example, his opera The Marriage of Figaro, had been performed and loved in Prague (without Mozart’s attendance) in 1786, even though the reception in Vienna had been lukewarm. Right outside the Estates Theater, there’s a large statue of a cloaked man without a face. The figure represents Il Commendatore, a ghostly character from Mozart’s work. Designed by Czech-born artist Anna Chromy and it’s a major photo spot for tourists. Legend goes that taking a photo of the statue with a flash will reveal a ghostly face within the empty cloak. Mozart was so beloved in Prague that when Leopold II was about to be coronated as king of Bohemia in 1790, Mozart was commissioned to write music for the celebrations. He wrote La Clemenza di Tito for the event and came in person to Prague to ensure the delivery went smoothly. When in Prague, Mozart was said to have stayed at the Bertramka Village, owned by František Dušek (a Czech composer contemporary to Mozart) and his wife. There are no documents (only anecdotes) proving that Mozart actually stayed here but Mozart and Dušek did know each other, so it’s possible that Mozart did visit and, as legend goes, was actually staying there when he finished Don Giovanni. On his first visit to Prague, Mozart stayed in the center of Prague, at the Thun Hohenstein palace of Count Johann Joseph Franz von Thun-Hohenstein. Mozart was known for improvising songs and concerts in random places. While in Prague, he played the organ at the Church of the Ascension of the Virgin Mary as well as the Church of St Simon and St Jude.